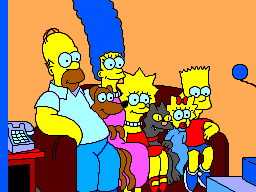 Ah... another retro Simpsons game. 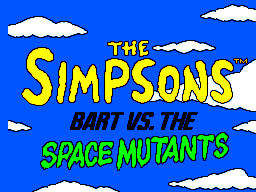 Bart vs. the Space Mutants is one of the few Simpsons games released in the 8 and 16 bit eras of gaming. The game is similar to Bart vs. the World in the gameplay as its a 2D side scroller. The plot of the game revolves around Bart saving the world from some evil Space Mutants who plan to take over the world. He must collect certain objects depending on the level (in some cases he must cover or spray paint over them) in order to foil the space mutant's plans. The box art looks promising enough, let's see how the game plays. 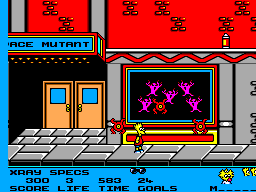 Bart travels through five levels, in which he must collect, demolish and cover objects so he can foil the space mutant's plans. You have certain items to help you do this such as: X-Ray glasses, Cherry Bombs, Rockets, Whistles and more. You've gotta hand it to the makers of the game for its creativity, they made the game as diverse as possible. Another thing, this game is pretty hard! It took me a while to beat it, for some people this may repel them away from the game. The graphics are what seperates this game from the NES version. In the NES version you can hardly make out what the characters are. The graphics on the Master System version is really what makes the game shine. Bart looks great in this version as you can see in the 3rd picture. It shows that the Master System was far superior to the NES in terms of technicalities. A HUGE improvement from the NES version, the sound effects are clearer and the music is not the Simpsons theme song music looped over and over again. Okay, the theme song from the show is nice, but imagine that looped over and over again for the whole of the game. The controls are slightly more responsive in the Master System version, however can be jittery at times. There are times where you try to jump from one platform to another and go right through the second platform. I would happily pick up Bart vs. The Space Mutants again and play it, mainly because of the challenge this game holds. As I mentioned earlier some poeple may find this game too hard to play again. If you've played Bart vs. The World and liked it, you should definetly pick this game up, it's almost like a sequel to it. In comparison to the NES version of this game, this version is far superior with better graphics (by a lot) and better sound.